Cut the fish into approximately 1-inch cubes. Season with salt, pepper, garlic, and lime juice. Let it rest for a few minutes. Toss the fish in the flour until well covered. Shake off excess flour in a colander. Heat the oil in a small pot and, when hot, fry the fish in batches. Transfer the fish to a plate covered with a paper towel to dry off the excess oil. Fry the green plantain slices separately until crunchy. Also fry the yucca until golden brown. Dry on a paper towel. To serve, plate the fish together with the green plantain slices and yucca on each plate. Top it off with a hearty amount of creole sauce and serve with the lime quarters and other sauces if you’d like. Creole Sauce: To make this sauce, soak the sliced onion in cold water for five minutes. Dry well and combine with the coriander, pepper, lime juice, salt, and pepper. Serve immediately. If you want to do more than just fish, add shrimp, scallops, calamari, octopus, and any other seafood you like. Fry each separately. This dish’s traditional sauces are creole sauce, yellow pepper sauce, rocoto pepper sauce, mayonnaise, tartar sauce, and of course, the quartered or halved limes. “Jalea” is Spanish for “jelly.” This dish, however, has nothing to do with the sweet jams we’re used to spreading on toast for breakfast. 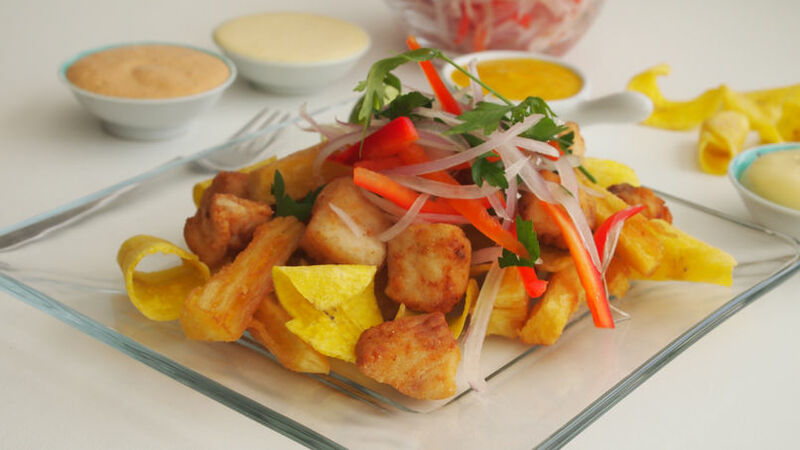 In Peru, “jalea” is actually a dish consisting of fried fish and seafood served with fried yucca and chifles, which are fried slices of green plantain. Don’t forget the creole sauce, or the creamy pepper sauce, mayonnaise, and lime. Although it’s easy to make at home, people often order jalea in restaurants. And when it comes to the table, everyone is always thrilled with the morsels of fried fish, known as fish crackling. Sometimes, jalea can be served as an appetizer to share, other times it can be served as an individual dish. The contrast in textures and temperatures is one of the things that I like most about this rustic yet exquisite dish. With Holy Week right around the corner, it’s good to note that this jalea is perfect for Easter or Good Friday.